QAQnA Mug Club Welcomes Jonty Pearce! This month, the Mug Club offers a hearty welcome to Jonty Pearce, editor of Call Centre Helper magazine. We wanted to honor Jonty for his faithful support, insightful comments, and kind encouragement over the past year. I had the opportunity to briefly meet Jonty and his family this past March and have enjoyed our correspondence. Call Centre Helper is an excellent resource for people at every level of the industry. The content is first-rate and Jonty does a masterful job of addressing issues across the spectrum from training and QA to technology and management. A QAQnA travel mug is on its' way across the Atlantic so Jonty can enjoy some coffee (or tea) with our Coffee Time Links! In a quiet little corner of the blogosphere, Ann Onimous blogs about her experiences as a call center Quality Assessment analyst on her blog Call Center QA Blues. Her blog provides an honest meditation from the eyes, ears, mind and heart of a QA pro. From her always humorous "QA word of the day" posts, to her customer service experiences, to her transparent thoughts about her job, Ann is one of my favorite bloggers. Ann has been a regular around QAQnA for a long time. She comments often and we've exchanged email on numerous occasions. She's has a sweet spirit and has been a great source of encouragement for me. Ann, welcome to the Mug Club! Enjoy your mug. We raise our coffee mugs in your honor. Many in the blogosphere know Mike Sansone of Converstations. Mike was foundational to QAQnA, is the first member of the QAQnA Mug Club and a dear friend. Mike is also very sick and doctors are stumped. He is in the hospital and on very strong meds. Mike has requested no visitors and no calls so that he can focus on getting better. Our best wishes go out to Mike and I invite everyone to join me in praying for Mike’s healing! she needs a coffee mug. So, C.B. has been awarded the newest member of the QAQnA Mug Club! If you haven’t read Christine’s blog, run – don’t walk – to your feed reader and subscribe. It’s been a while since the hallowed Golden Mug was bestowed on an unsuspecting blogger. I take personal responsibility for being a slacker. So, we end the hiatus by adding a very worthy blogger to the Mug Club. Chris Cree has been a faithful reader and commentor here at QAQnA. Chris lives with his wife, "Gorgeous" in Savannah, GA and his blog Creeations is a worthwhile addition to any blog roll. His blog is an enviable mixture of his spiritual, personal and vocational perspectives, allowing all of us a peek – not only into his mind – but into his heart as well. Chris is an encourager, spreading his optimistic spirit around the blogosphere. It seems like every time I find a new blog, Chris has already been there and left his uplifting imprint. Being from Savannah, Chris always seems to add a touch of southern hospitality to everything he says and does. A golden mug is on its’ way to Georgia, and we’re excited to welcome Chris to the Mug Club fold! I had a "great" day in Milwaukee yesterday. I hooked up with Phil Gerbyshak and has the priviledge to personally welcome him into the QAQnA Mug Club. Phil’s blog "Make it Great!" is a source of great inspiration across the blogosphere. Phil showed me around downtown Milwaukee and we enjoyed getting to know each other over lunch. Contagious optimism. Phil’s blog is a constant positive stream of thought, information and links. If you need a little boost in your day, Phil’s blog is always a great place to go. Authenticity. If you’ve been around Phil’s blog you might wonder if the guy is really that upbeat. After yesterday I can tell you that Phil "walks the walk." Phil’s optimism is deeply sourced and it’s the real deal. Spreading the Love. One of the other things I’ve learned about Phil is that he’s focused on helping others. He’s just completed his first book and he’s passionate in his focus on equipping others to "make it great." Phil’s blog will expand your network, give you some uplifting food for thought and constant encouragement. Meet New Mug Club Member Ellen Weber! Congratulations to Dr. Ellen Weber of Brained Based Business, the newest member of the QAQnA Mug Club! Ellen is a regular here at QAQnA and always adds measurable value to the conversation. As with all Mug Club members, she receives a prestigious gold coffee mug and the coveted Mug Club badge to post on her blog. Ellen is an uber-blogger. I’m amazed at her output. I check my feedreader and there are times when she’s posted more in a day than I have in a week. I admire the steady stream of quality content she shares with all of us. Ellen has unique content. Her blog covers content I don’t find anywhere else on the blogosphere. Since we are all affected by our brains, her blog is beneficial to everyone. Ellen is an ambassador of good-will. Her comments are always encouraging, her posts and links are always upbeat, and she is constantly sharing what (and who) she knows with others. A month ago I was checking my stats and found that I was getting tons of hits from Ireland. I came to find out that Ellen was over there sharing links across the Emerald Isle. Ellen’s blog will be a good read and will provide you with plenty to ponder in business as well as your everyday life! Congratulations, Ellen! You’re a winner! 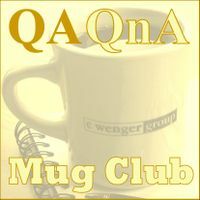 Congratulations to Liz Strauss of Successful Blog, the newest member of the ever-growing QAQnA Mug Club! Liz has been a true friend to our little homestead in the blogosphere. She bestowed on us her S.O.B. designation, frequently stops by for a visit and has linked other bloggers our way. As a Mug Club member, she has a prestigious gold coffee mug on it’s way to the Windy City and the coveted Mug Club badge to post on her blog. Liz spreads the conversation like no one else. Another blogger once told me "someday when the history of blogging is written and how it changed the world, Liz is going to be mentioned as one of the key people who made it happen." I concur and will be willing to say so in a future History Channel documentary. Liz uses blogging creatively. Her weekly SOB awards are a stroke of genius, encouraging bloglings (got that term from Christine Kane while we were visiting Liz’s blog) and spreading good cheer. In addition, her Tuesday night open mic took blogging into a whole new blogging dimension ("not of sight and sound but that of the imagination – that’s the sign-post up ahead"). She has unquenchable optimism. Liz is one of those people I want to be around, just to bask in light and cheer that radiates from her and her blog. Congratulations, Liz! You’re a winner! Mug Club Winner – Maria Palma! Congratulations to Maria Palma of Know More Media’s "Customers Are Always" blog, the newest member of the ever-growing QAQnA Mug Club! Maria recently spotlighted us for an interview, and before that she’s frequently posted comments and linked her readers over to our humble little blog. For that, Maria has a prestigious gold coffee mug jetting it’s way via Priority Mail and the coveted Mug Club badge to post on her blog. Maria is a voracious poster. Each time another one of Maria’s posts pops up on my SharpReader, I’m shaking my head and wishing I could keep up that pace. Good for you! Her content is excellent. With all those posts, I have a hard time prioritizing which ones I want to comment on – they’re all on-target! She keeps the conversation going. Everytime I’m visiting a blog it seems like Maria’s already been there with a comment or linked to it in a post. Way to go! Maria’s blog will provide you with thoughtful posts and quality links. I also trust that Maria will engage your blog in a dialogue, not just expect you to listen to her monologue. Congratulations, Maria! You’re a winner! Mug Club Winner – Starbucker! In a death-defying blogging exercise, we’re going to blog-tip and announce the newest member of the QAQnA Mug Club in one post. Starbucker has become a regular around here and his blog Ramblings from a Glass Half-full is one of my favorites. Attitude. You gotta love an optimist, and Starbucker often gives me a lift on my cloudy days. Consistency. I’m always amazed at his steady stream of quality posts and the voracity with which he reads and comments on other blogs. I’ve been preaching that “slow and steady wins the race” in the blogosphere and Starbucker is a pacesetter for me. Authenticity. I like to get to know the person behind the posts, and one of the things I’ve enjoyed about “The Glass-Half Full” is the way Starbucker mixes in both the business and the personal. I think his “Sunday Paper Edition” is a stroke of genius. One tip I would have for the blog is to hear more (what can I say? I’m insatiable!) I’d like to hear more about what makes you an optimist, or maybe what past experiences made you an optimist. I’d also like to hear more of how optimism frames your life and business in practical ways. When reading Starbucker’s blog, you’ll get great content, quality links to other blogs he’s reading and all of it written with his indomitable spirit!